The Kansas Emergency Relief Committee was created in July 1932 to obtain and administer federal emergency loans made available to states through Herbert Hoover's Emergency Relief and Construction Act of 1932. President Franklin Roosevelt expanded on this act with the Federal Emergency Relief Administration (FERA) in 1933, leading the Kansas committee to change its name to the Kansas Emergency Relief Committee (KERC). Under the direction of Kansas's new governor, Alf Landon, the KERC managed direct and work relief programs in Kansas including emergency education, transient relief, rural rehabilitation, drought relief, and a slew of public works projects including the construction of farm ponds and lakes, and the renovation and construction of public buildings, roads, and quarries. This item is a preliminary statement on the water conservation program put forth by the KERC. 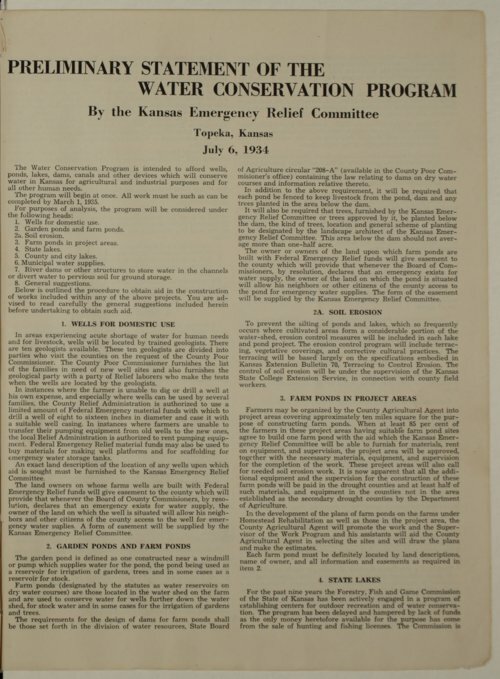 This program intended to "afford wells, ponds, lakes, dams, canals and other devices which will conserve water in Kansas for agricultural and industrial purposes and for human needs."